Julia recently performed in a video generously supported by The Only Animal and the David Suzuki Foundation. How can we make climate change activism go viral? Actor / playwright, Anais West, explores the concept for a play called Syrenka, that explores political and environmental issues in Poland with a queer, musical twist. This is part of a series with The Only Animal called Greenlight. Greenlight is an innovative educational program mentoring youth to respond to the biggest challenge of their generation, the climate crisis, by creating original creative interactions between storytelling and the digital places these youth hang out: websites, social media sites, and the apps on their phones. World Premiere. Throughout art and history, the biggest roles and adventures have been given to men. Not in this play—a fictional recontextualization of real-life events. 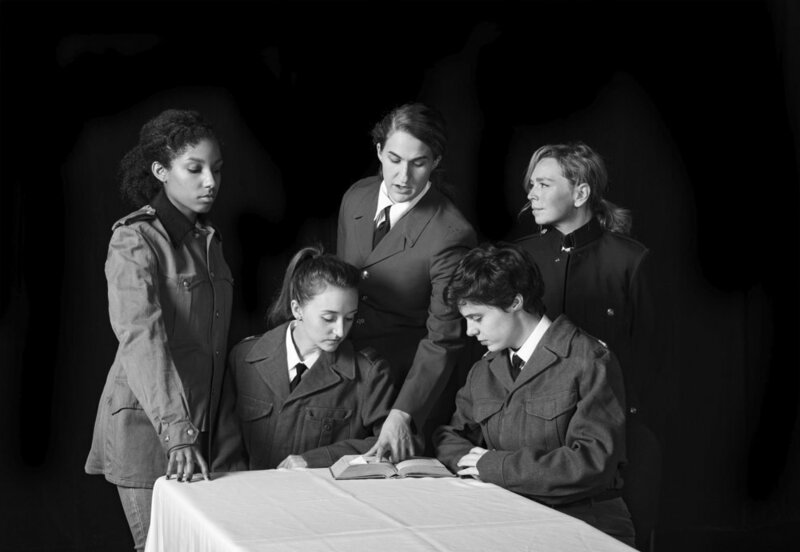 In Three Winters, a troupe of seven millennial actresses play WWII soldiers captured in the Stalag Luft III POW camp. Those men not only infamously hatched escape plans—immortalized by 1963 film, The Great Escape, they performed plays sent by the Red Cross, which required the men to play both male and female parts. When these historical events are acted by modern young women, not out of circumstantial necessity, but by choice, Three Winters asks audiences to question their assumptions about who we allow to play what parts and why. Part of the Ceasefire Series: an exploration of past and present warfare to commemorate the 100th anniversary of the armistice of WWI. A re-mount of The Vancouver Premier of Jennifer Haley's "The Nether"
A site-specific staged reading workshop presentation of George F. Walkers script. Ebenezer Scrooge is a miserable old miser who hates irrational things like happiness, generosity, and Christmas, until a trio of ghosts shows him the error of his ways. Pacific Theatre goes back on the air, giving this beloved holiday tale new life through the charm and magic of a 1940’s-style live radio show. Featuring Peter Church, Matthew Simmons, Chris Lam, Diana Squires, Paul Griggs, Kirsty Provan, and Julia Siedlanowska. Set and Costume Design by Amy McDougall. Lighting Design by Kougar Basi. Stage Management by Shelby Bushell. "Julia Siedlanowska also impresses—with tender simplicity—as Belle and Tiny Tim"
"The euphonic jingles showcase the tight harmonies of Julia Siedlanowska, Diana Squires, and Kirsty Provan." Stone’s Throw Producitons is partnering with Rebel Haunt Theatre to explore Hans Christian Anderson’s classic and heart wrenching children’s classic “The Little Match Girl” in a site-specific, outdoor performance. This 20 minute performance begins in Pacific Theatre’s lobby and tours around the building. Please dress for the weather. We will be accepting donations of warm clothes for Covenant House at these performances and throughout the run of A Christmas Carol: On the Air. The greatest needs include underwear, men’s shoes (size 10-13 or larger), and men’s jeans. Also needed: warm scarves, sweaters, rain gear, “teen” style clothing, and toiletries. Artistic Team: Directed by Sarah Dixon. Featuring Julia Siedlanowska, Shona Struthers, Carolyn Nakagawa, Andrea Ashton, Mistaya Kryder-Wu, Kaitlyn Pederson, Kimmie Kidd. Stone's Throw Productions presents THE DROWNING GIRLS, by: Beth Graham, Charlie Tomlinson, and Daniela Vlaskalic, Nov 18-20, 2015. Three women emerge from their bathtubs, sharing two indelible bonds; they were each married to George Joseph Smith and they are all dead. The Drowning Girls tells the true story of a con man and serial killer who, in the early years of the 20th century, married and murdered three women in identical situations. Earning their confidence, he quickly married the women, stole all their money- and drowned them. The historic case is examined in this award winning Canadian play by Beth Graham, Charlie Tomlinson, and Daniela Vlaskalic, which had its premiere in 1999, and again in an expanded version in 2008 that has since been performed all over the world. This production is especially unique given its all-female creative team. In a time where gender equality issues are still at the forefront, it is fitting for a play about domestic violence to be presented from a completely female perspective. "When we hear the story behind The Drowning Girls - a man who has despicably and cruelly drowned three wives for their money - we tend to expect a deeply emotional play. While there are certainly moments that address the emotional gravity of the situation in the script, the play is asking more than that - it's asking us to think," says director Ulla Laidlaw. "The playwrights effectively show us the realities of our society. They repeatedly interrupt us from having an emotional experience - it's very Brechtian in that way." Tickets will be sold in a daring pay-what-you-think-it's-worth model, allowing audience members to determine the value of the production on their own, and consider their financial relationship to theatre. Artistic Team: Directed by Ulla Laidlaw. Featuring Kim Larson, Julia Siedlanowska, Jess Amy Shead. Set, Props and Lighting Design by CJ McGillivray. Lighting Design by Milly Mumford. Costume Design by Rebecca Burks. Stage Management by Monique Fillon. Assistant Stage Management by Diana Bartosh. Director Sarah Dixon and performer Julia Siedlanowska present a charming tale about young Josette and her magical journey on a highwire across the heavens. In every moment of its brief half hour, She Began to Cross the Sky looms large to remind us that even our most naive, childlike creative passions and impulses have within them the same beauty and scope as the universe itself! In Dixon and Siedlanowska's magical tale, brave little Josette refuses to submit to the banal demands of her mother and teacher, and seeks adventure on her highwire. Setting forth to explore the heavens, she finds herself transformed into a little bird who must use her wits and courage to change the cosmos. In the tradition of Thornton Wilder, Rebel Haunt’s plays link the immediate with the eternal. Artistic director Sarah Dixon calls her approach Micro-Epic Theatre, a method she’s applied to several of her innovative productions, including The Middle of Winter (2006), Rebel Haunt (2007), Home Stand Still (2008), Robotic Feeling (2009), The Dark (2010), Match Girl (2010), Entschuldigung (2011), Hometown (2011/12/13), Scavenger Heart (2011/12), The Venosta Radio Hour (2013/14) and Moonfall (2014). She and Julia Siedlanowska have worked together in a variety of productions over the years, and they share the bond of artists who have repeatedly braved the stage in all its fearsome wonder. Julia is a BC based actor/director. She graduated with a BA in acting, with honours, from the University of Wales. She is currently working as a company apprentice at the Pacific Theatre. In 2015 I took part an audience interactive roaming performance as part of the Vancouver Cherry Blossom Festival. In addition to playing Cherry, a tree-spirit fairy that ran wildly through the festival with her partner Blossom (Claire Love-Wilson) I also had the opportunity to create a movement piece in collaboration with “hfour,” a company which creates immersive experiences through lighting. The combination of music, lighting, and live, site-specific performance reminded me of my love for collaborating with artists of different disciplines to create a unique and electrifying experience. "Tango is a drama written by Polish writer, dramatist and cartoonist Sławomir Mrożek (1930–2013). It was first published in the literary magazine Dialog (Dialogue) in 1964. Tango was staged for the first time in Bydgoszcz in 1965. The drama has been translated into English, Italian, Japanese, French, Danish, Hebrew, Czech, Slovenian, Dutch, Estonian, German, Spanish and others." Fist presented at the Evergreen Cultural Centre, we then toured the play to Edmonton and Calgary, presenting to the Polish Communities there in Polish with English surtitles. On the night before her wedding, Mary dreams of love, war, what was and what could be. Her thoughts focus on her first love, Charlie, who she met by chance in a barn while seeking shelter from a prairie thunderstorm. An innocent romance develops, only to be thwarted by the turbulent times of 1914. Separated by war, Charlie sends letters from the front, and a story of love, loss and healing emerges in a beautiful and poetic theatre experience written by one of Canada’s leading playwrights, Stephen Massicotte. Currently living and working in Vancouver, BC, Unceded Coast Salish territories.